The La Salle Academy boys of Rhode Island saw their stock rise significantly on Saturday morning, as the squad's top two runners in David "D.J." Principe and Matt Bouthillette ran the nation's first sub-15 minute 5ks. Principe, ranked Flo50 #24, finished first in 14:59.03 with Bouthillette just behind in 14:59.23. 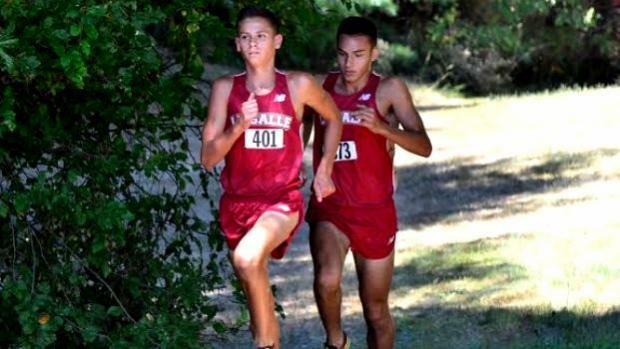 La Salle, ranked Flo50 #12, easily won the team title 26 points even without senior Jack Salisbury, who ran a 4:06 mile this spring and could conceivably be the team's No. 1 runner. The La Salle girls are also ranked No. 12 in the Flo50 and ran away with a 17-point victory. Karina Tavares, Eliza Rego and Emily Kane all finished in a dead heat at 18:43 to sweep the championship section. If Salisbury were to race, one wonders if the boys would have pulled a similar 1-2-3 sweep with all under the 15 minute barrier. Dangerous things are brewing in Rhode Island!